"Authentic" Life Planner Stickers are all about you and how great you really are! 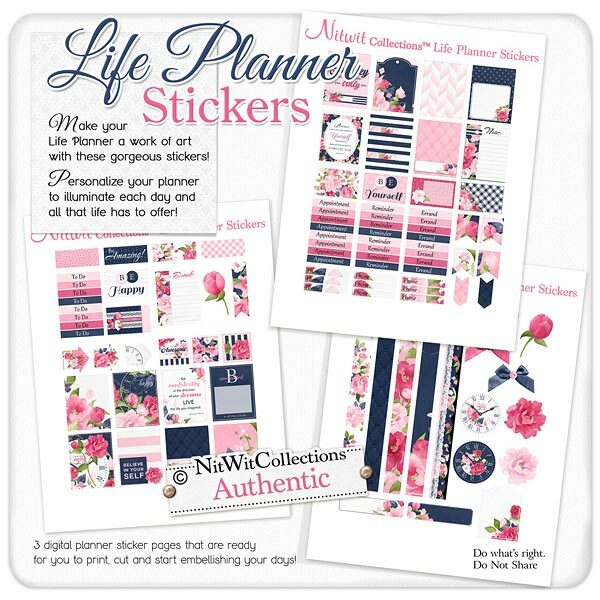 The bold and confident pink and navy colour palette of these digital stickers and embellishments are the perfect blend to celebrate your life and personality.....as we all have our strengths and beauty. 2 - Arrow elements which would make great bookmark elements when applied to a paperclip! 3 - Arrow elements that are more detail embellished to use as highlight items or pointing to a specific date due to a large event, perhaps?! 2 - Single roses on a stem....decorate your page in style! 1 - 7.25" long digital washi tape like element with a scalloped edge...you know that you deserve some elegance!